Want to play your own Family Feud game at home? 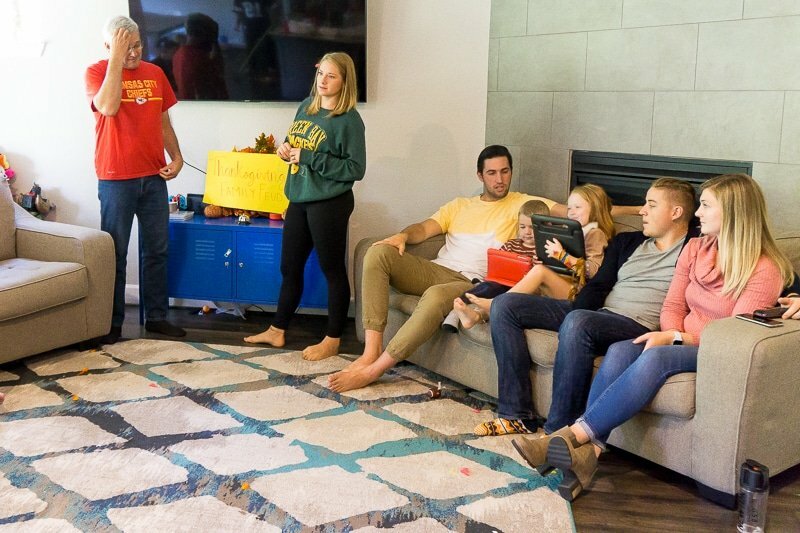 Keep reading for instructions to play Family Feud at a party or just with your own family! And bonus, tons of Thanksgiving and Christmas Family Feud questions and answers to have your very own Family Feud holiday fun this year! This post contains affiliate links. If you purchase via my affiliate links, I may receive a small commission at no additional cost to you! I polled 100, okay more than 100 people, and asked them the following question – who loves the Family Feud Game show? And the answer was pretty much everyone. There’s just something hilarious about watching people try to come up with answers that other people might have said. The best part are the things people say when put on the spot and with a timer. I thought it would be fun to play a little Family Feud game while my family was in town because I’ve always dreamed about playing after watching the game show. Although I mostly watched the game show back in the day before Steve Harvey took over and it became Celebrity Family Feud. It’s fun to watch celebrities but not quite as fun as watching real people. In my opinion at least. And now it’s one of my favorite Christmas party games (and Thanksgiving games) ever! Let’s start by backing up a bit. The Family Feud Game show has been on forever. Well sort of, it was on and then it wasn’t. It started in 1976 hosted by Richard Dawson and that’s the show I grew up watching. And now it’s back like I mentioned with Steve Harvey hosting the new version of Family Feud. The basic idea is this – two families compete against one another to come up with the most popular answers to sometimes outrageous questions. 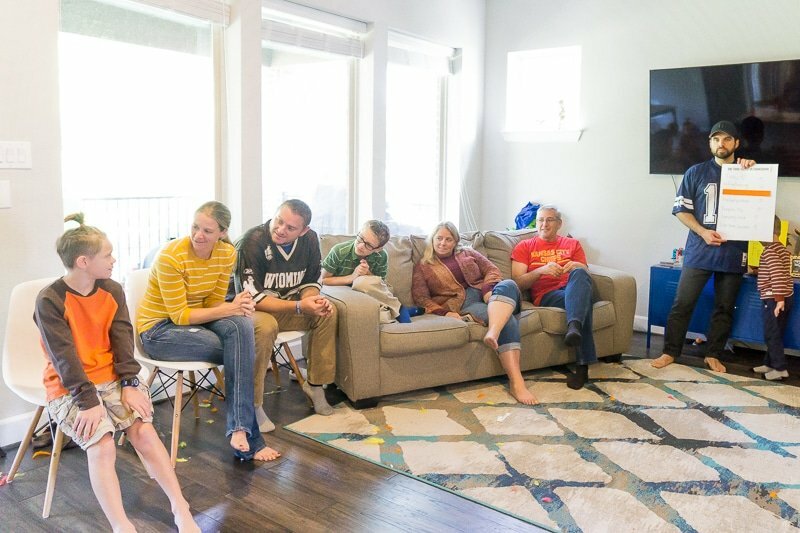 The family that gets the most points get to go to the lightning round called “Fast Money” where they have the chance to win $20,000. 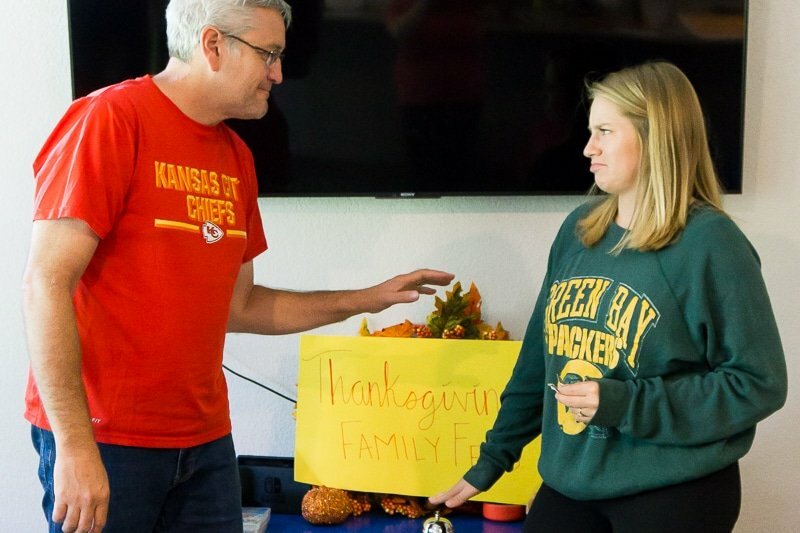 The fun part is that unlike some game shows that you can’t really recreate at home – Family Feud is easy and really fun to recreate at home, especially since I made the questions for you! All you need to play are two families (or groups of people), a buzzer, poster board with answers written on them, the list of questions (for you only), and a scorecard. Throughout this post I’m going to say family but you could totally use any group of people as well and just put them on a team. Before your party or Family Feud night, simply write out the top answers to each of the questions in the PDF document (get the printable below) on a poster board then cover each with a long piece of paper to cover the answer. Then write your question/topic at the top of the poster board; you’ll just need to keep the poster boards hidden so no one knows the questions ahead of time! Set a buzzer or bell on a table or chair in the front of the room and have couches or chairs for your families/teams on either side of the bell. Have one family sit on one side of the room and the other family sit on the other side of the room. Have the team captain from each team come to the front of the room where the buzzer is. Read the first question (e.g., Name something you eat on Thanksgiving) and the first person to hit the buzzer has five seconds to answer what they think is the best answer. Best answer meaning the one that is the highest on the list of answers – obviously going for #1. 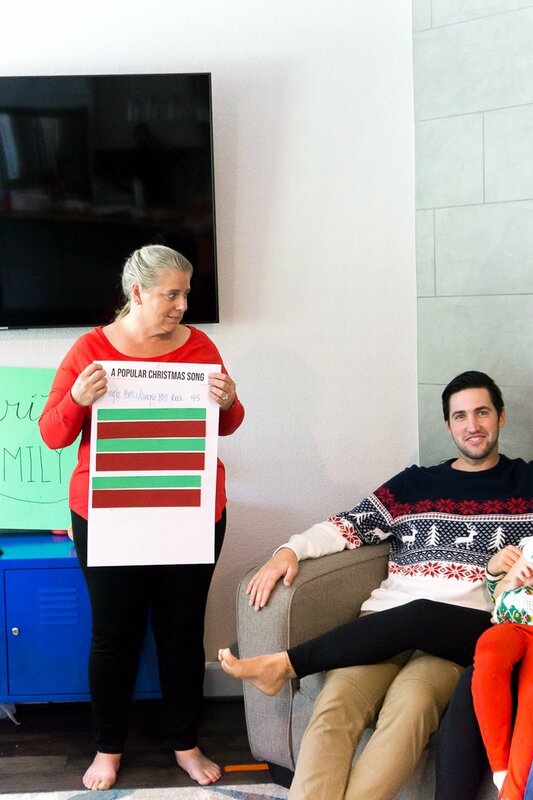 If the person gets #1 on the list, their family has the choice to pass or play the round. If the person does not get #1, the other person in the face-off has five seconds to give an answer to try and get #1. If the second team gets #1, their team has a chance to pass or play the round. As answers are given, if they are on the list – remove the paper from over the item on the list so they can see what’s already been guessed correctly. If a team chooses to pass on a round, the round is played by the opposing team. To play a round, go to the next person in line in the playing family and ask them the same question (e.g., name something you eat on Thanksgiving) and they have five seconds to give an answer. If their answer is on the board, show it on the poster board and celebrate. Then move on to the next person and repeat until the team either gets the answer or gets three strikes. A family gets a strike if they say an answer that is not on the board. If a team gets three strikes, the opposing team has the opportunity to steal all of the points on the board by guessing one of the remaining answers on the board. If they guess one answer correctly, they receive all of the points that are with answers that have been uncovered. So if they had guessed Answer A for 50 points, Answer B for 10 points, and Answer C for 20 points, they would receive 80 points (but not any points for answers not uncovered). This ends the round. For the next round, have the second person on each team come up to the buzzer for the second face-off. Do the exact same thing with your second question, except when you go back to the playing family – go to the next person in line after the person who completed the face-off. Keep playing for as many rounds as you’d like – I recommend one per family member. We had five family members on each team, so we did five rounds. And to keep it interesting, you can double or triple the points for later rounds so teams that are losing still have a chance to win! At the end of the rounds, the family with the most points wins! I put together a short video of how to play family feud along with some classic footage of my family playing! Pretty sure my sister is never going to live down missing the #1 answer for the what do you eat on Thanksgiving question! When you’re playing at home, you can either play or skip the fast money portion of the game since obviously you’re not playing for real money. We skipped the fast money round because I just gave a prize to the team who won and fast money is really just to increase the prize winnings. But if you want to play fast money, I did include a couple of additional questions that would work well for fast money. To play fast money, pick two people from the winning team. Have one person go outside or in another room where they cannot hear the answers the first person gives. Put 20 seconds on the clock then quickly ask the first team member the fast money questions, writing down their answers as you go. In fast money the do have the option to pass and come back to another question if they’re stuck, but they only have 20 seconds to answer all five questions. Once they’re done, go through their answers and tell them how many points they earned from their answers (points included in the PDF document). Then have the second person come back in and do the exact same thing except for two changes – they have 30 seconds to answer and if they give the same answer the first person did, simply say try again and they have to come up with another answer. Total up the points from the first and second round and if they get 200 total points, they win fast money and whatever you decide is the prize for winning fast money! I created two different sets of holiday Family Feud questions and answers – one for Thanksgiving and one for Christmas with the help of a survey I sent out to my email list and my family and friends! I had over 500 responses, so know that I didn’t just make these answers up – these are based on the survey of over 500 people! The answers are legit and pretty hilarious. Rather than putting them in two separate posts, I just combined them all to make it easier for you to just print out one PDF and play during both holidays! I’ve included the lists of questions below, but you’ll have to download the printable PDFs to get all of the answers and points! 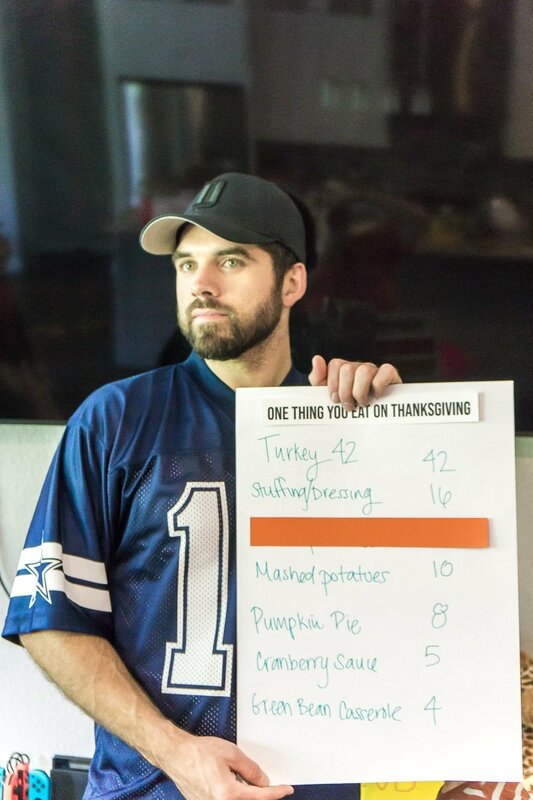 Name one thing you eat on Thanksgiving. 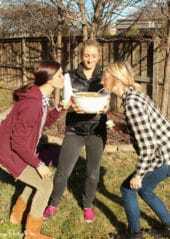 Name something you do other than eat on Thanksgiving. Name an NFL team that plays on Thanksgiving. Name a flavor of pie. Name one word associated with pilgrims. Name one store that has the best Black Friday sales. Name the worst day to fly for Thanksgiving. How many people do you spend Thanksgiving with? What time do you get up on Thanksgiving Day? Which Thanksgiving food normally has the most leftovers? 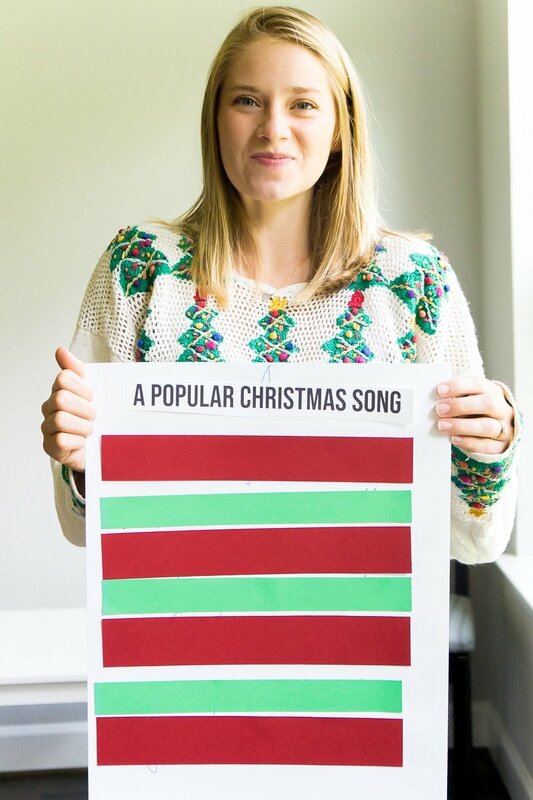 Name a popular Christmas song. Name the best Christmas movie. Name one thing you do on Christmas Eve. Name something you put on a Christmas tree. Name one gift you should never get someone for Christmas. If you met the real Santa, name one thing that would give it away that it was the REAL Santa. Name a popular Christmas book. Name something you eat for Christmas dinner. Name the worst gift from the 12 days of Christmas. Name the hardest person to shop for. Name something you drink during Christmas time. Name one of Santa’s reindeer. Enter your first name and email address in the form below to get the PDF with the Thanksgiving and Christmas questions and answers! If you cannot see the form, click here to get to it. Since I’m guessing handing over $20,000 to the winning family isn’t an option for most of us, here are some fun Family Feud themed prize options to give to the winning family instead. Maybe pick one of the bigger items for the winning family and have a little bonus item if they win fast money! 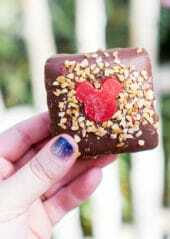 And treats are never a bad consolation prize for the family who doesn’t win! I’ve already had quite a few questions asked about how to play this family feud game, so I wanted to go ahead and answer some of the more popular ones here! If you have other questions, feel free to leave them in the comments and I’ll respond as quickly as possible. What are good Family Feud questions? Good family feud questions are included in the PDF above – all of them are kid-friendly enough that even young kids can play as you’ll see if you watch the video! My 5-year-old and my 6-year-old niece were often times the stars of the game coming up with answers the adults forgot about! It’s ideally a game that the entire family can play together! Are Family Feud surveys real? Yes, Family Feud surveys in this post are real. I did a survey of 500 of my readers and the answers are 100% real, which is why I personally couldn’t have guessed half the answers! If it helps, my readers are mostly from the United States and make up both men and women of all ages. How to play Family Feud with a large group? To play Family Feud with a large group, split your group in two and play with each half of the group as a family. The one major thing missing is that not every will get the chance to do the face-off, but if you play enough questions – everyone should get the chance to give answers at least a few times. Or alternately, just play two different games with smaller groups so people get to participate more. How to play Family Feud at a party? To play Family Feud at a party, just follow the instructions above and split into two teams instead of families. And if it’s a large group, see the question right above this! Can you pass in Family Feud? No, you cannot pass in Family Feud except for in Fast Money. You have to give an answer during the regular rounds or your team receives a strike. If you pass in a Fast Money round, you have to be fast enough to get back to the question and give an answer before time run outs. Who should host the Family Feud game? Ideally you or whoever is setting the game up should host the Family Feud game. You can’t play if you put together the question and answer boards, so whoever does that should host. Don’t forget to pin this Family Feud game for later! How did you make the answer posters? What’s covering each answer?! Poster board cut in half is what the answers are on. I just used strips of construction paper to cover them. Then I had the answer sheet in my hands so I knew which ones to pull or which answers were wrong. Thank you so much for putting all of this together!! Awesome!! This will be great for my sewing & quilting group party 😊 thanks so much! I’m so excited for you guys! My family really loves family feud right now. The prize is usually something for everyone to share. Like a bag of candy or snacks. You could also have small $ gift cards that the winners will get. I’m not sure how to answer this question. It will totally depend on what the prize is. I gave out a game for our prize so the family took the game home and played it together. I LOVE your ideas!! Thank you! My family loves to play games and we like to give scratch off lottery tickets as prizes to the adults. 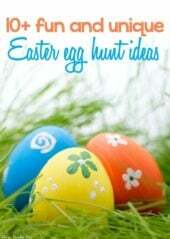 If kids are playing, we give them candy or an inexpensive game or toy like silly putty, matchbox cars, or old maid. I also shop the after-Christmas bargains for clearance items that I can use for next year’s party. 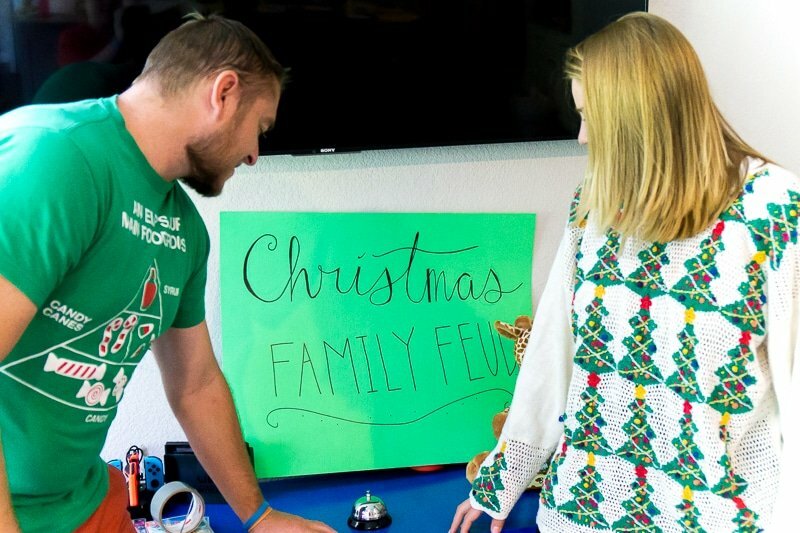 Do you have a Christmas Family Feud game that can be purchased? 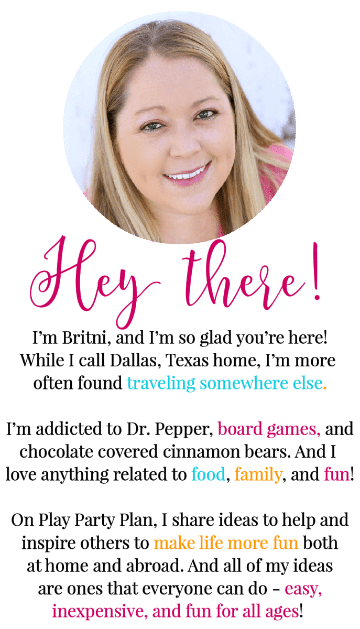 I do not – just the free one in this post! We had a blast playing your game last night. Thanks for all of the great ideas. I wanted to post a picture but I can’t figure out how to do that.